Sat., April 27, 9am-4pm (closed Sunday). Clean & Green! 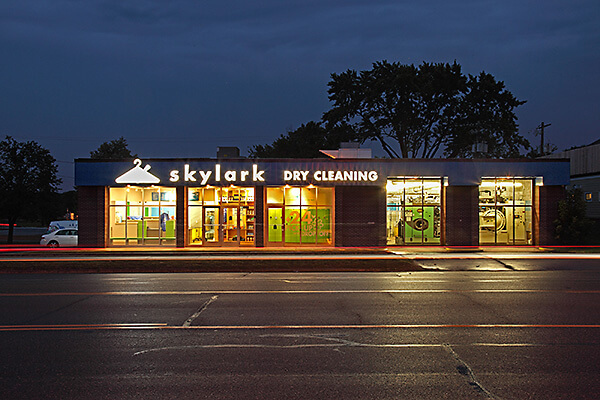 Skylark Dry Cleaning is an eco-friendly sustainable business that uses a chemical-free dry cleaning process. The location was in the middle of vacant and underutilized properties. The new facility is an adaptive reuse of a former vehicle garage. The dilapidated building proved to be an ideal size and location for the new plant, offices, and retail store. Skylark spurred development by subdividing their property for the Animal Emergency vet clinic to build next door. McMonigal Architects worked closely with the plant designer to integrate computer-assisted assemblies of the orders. At 2:30 on Saturday, April 27, hear a presentation by Rosemary McMonigal on the “Clean & Green” approach to this adaptive reuse project, with a tour of the plant, and time for Q & A. Ask about the river otters!